Promotion-chasing Wolves head coach Kenny Jackett admits that he was "hurt" by Tuesday night's 2-1 loss to Oldham in their FA Cup first-round replay. Jackett has the consolation of seeing his side top of the League One table, having lost just once in 16 matches. But, although without key men James Henry, Bakary Sako and Kevin Doyle, he admits that Wolves let themselves down. "Overall, there is a bigger picture. But this hurts," he told BBC WM. "With that team, we should have done better." 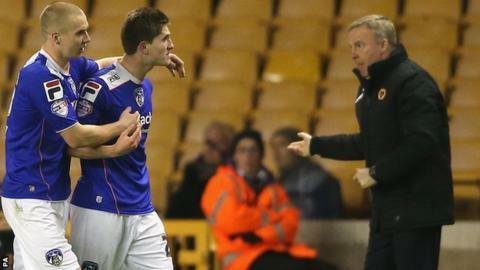 Wolves had beaten Oldham 2-0 in League One less than a month earlier. After losing at Morecambe in the League Cup in August, Wolves have now been knocked out of both the Johnstone's Paint Trophy (by Notts County on penalties) and the FA Cup (by Oldham) on home soil by two of their League One rivals. But, having then been held 1-1 by the Latics at Boundary Park when the two sides were paired together again in the Cup, the Molineux replay proved even more frustrating. "Oldham had more appetite for the game than we did and deserved to win," he added. "People had opportunities and should have made better cases. "Until the last quarter when we changed to a diamond, we didn't get though the final third." Having confirmed that on-loan Millwall winger Henry will be out "for a few weeks" with his groin injury, Jackett also admitted that he was not yet sure of the full extent of Sako's hamstring injury. "His hamstring is tight," said Jackett. "He was left out as a precaution so we don't know yet. "We'll see whether he plays any part in the next three games, against Brentford, Tranmere and Peterborough."